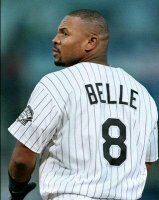 This is all of the information on Albert Belle that I have accumulated over the years. I cannot guarantee that everything is correct or is not outdated, but it should be pretty close. I got all of my information from articles, newspapers, magazines, quotes, websites, and baseball cards. - Albert is good with figures and crosswords. - Albert is an Eagle Scout (him and Terry became Eagle Scouts their sophomore year of high school). - As a senior in High School Albert was a member of the National Honor Society, a class officer, and Vice President of the Future Business Leaders of America. - Albert was a star baseball and football player at Huntington High. On the football team Albert was the starting quarterback, free safety, and kicker. - Albert majored in accounting at LSU and part of his scholarship was academic. Albert's favorite subject was math, he took 3 math classes his senior year of high school and even took an advanced calculus class with only 2 other students. - In 2003 Albert received his undergraduate accouting degree from LSU. He had promised his parents that he would return to school and receive his degree. - Albert's mother is a retired math teacher and his father is a retired high school baseball and football coach. - Albert was offered a football scholarship to Notre Dame and received a prestigious appointment to the Air Force Academy but decided to go to LSU to play baseball after making the all-state baseball team. - Albert was on an episode of the television show Hangin' with Mr. Cooper in 1996. - Albert won a silver medal for the USA in the 1984 Junior Olympics. He not only played outfield, but pitched and won a game! 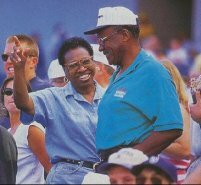 - Albert was ranked #31 on Forbes' Top 40 Athletes of 1997. 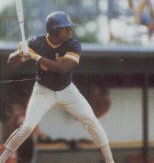 - Belle played some shortstop in the minors in 1988. - Albert chose to wear the number 8 because players in the past who have worn 8 put up good numbers. - Albert has worn 3 numbers in the Majors: 36 (Indians), 8 (Indians and White Sox), and 88 (Orioles).